Over 130 top teenage scientists from all around the world have arrived in Dublin to take part in the 30th EU Contest for Young Scientists. The event will showcase 90 projects over the next four days at the RDS. The EU Contest for Young Scientists was founded in 1989 by Jacques Delors and takes place in a different country every year. It pits the best second level scientists from Europe and a number of other non-EU countries against each other. It is 14 years since Ireland last hosted the competition and today the participants will begin setting up their projects in the RDS. 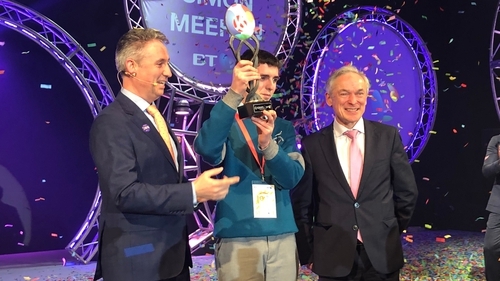 Among them will be Simon Meehan, from Coláiste Choilm in Cork who won this year's BT Young Scientist and Technology Exhibition. His project investigated the antimicrobial effects of root parts of selected plants against Staphylococcus aureus. Ireland has a great record at the contest, winning the top prize in 14 of its 29-year history. The event, which includes special science shows, is open to the public on Saturday, Sunday and Monday, and the free tickets are available at eucys2018.com. The winners will be announced at an awards ceremony on Tuesday.